If you’ve read the post below, you would have known that I am experiencing tons of problems with my .com blog. Maybe I was being a little too ambitious, thinking that it would be a piece of cake to set up a .com. But, apparently that’s not the case! I should have spent more time exploring and troubleshooting the blog before rushing to release it, but it’s too late to cry over spilled milk, so I’m just going to continue blogging here first, then when one day the .com is working fine, I’ll let you guys know again! Now, let’s talk about some happy things: cookies! Setting up a .com may not be a piece of cake, but baking these cookies definitely is! 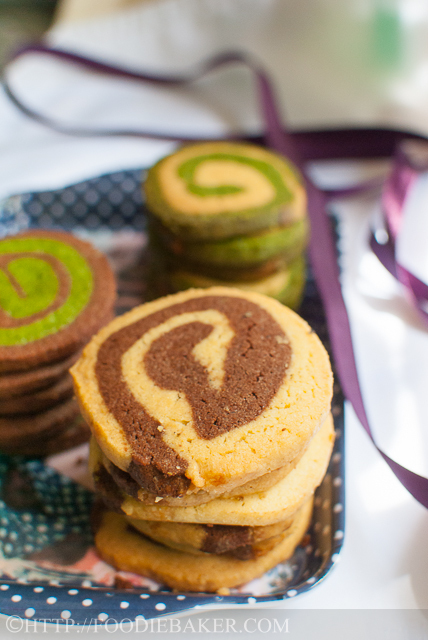 And these cookies can come in lots of delicious flavours – I’ve baked mine into vanilla, chocolate and matcha. Omnomnom! Strawberry-Vanilla / Strawberry-Chocolate: Add in a little dried strawberry powder in one batch of the dough. Lemon-Vanilla: Grate in some lemon zest and add in a little yellow food colouring and pair it with delicious vanilla. Cinnamon-Chocolate: Mix in a little cinnamon powder into one batch of the dough to get a spicy kick. 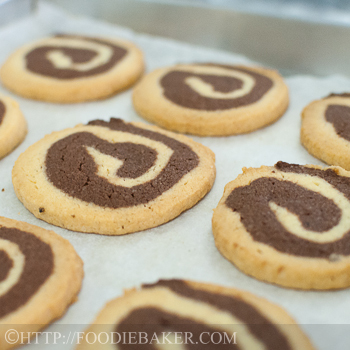 If you don’t fancy spiral cookies, how about some checkerboard cookies? The possibilities are endless, yet these buttery and flavourful delights will never fail to please the crowd, and here’s how to bake them! 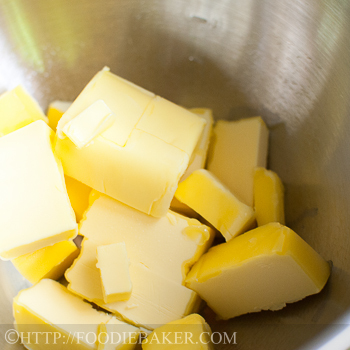 1) Measure butter and let them soften at room temperature. 2) Cream the butter and add in sugar gradually. Good quality butter should be used here as it is a very simple cookie – and the simpler the recipe, the better the quality the ingredients should be used. 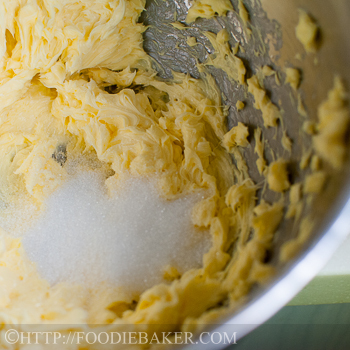 Softened butter enables the sugar to be incorporated into the butter better. 3) Add in the egg yolk and beat until combined. 4) Add in flour mixture. 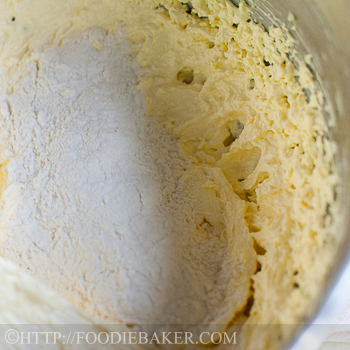 I always mix in the flour by hand – though you can mix it in with an electric mixer at low speed. A soft dough will be formed. Roll the dough out, stack them and roll it up into a log. 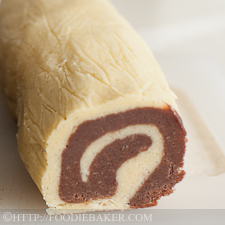 The cookies will expand while baking, so make the logs smaller! 8) After a couple of hours in the fridge, slice and bake! I’m submitting this to Bizzy Bakes’ Recipe Box #32! Place the butter in a large mixing bowl. Cream with an electric mixer until creamy. While the mixer is running, add in the sugar gradually and beat until the mixture is light, pale in colour, creamy and fluffy. 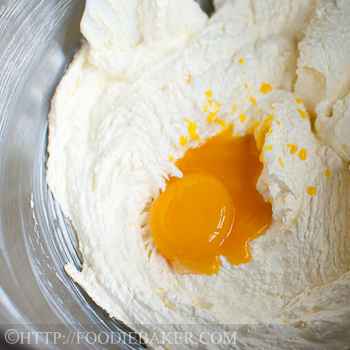 Add in vanilla (if making vanilla dough) and the egg yolk and beat until the egg yolk has been incorporated. 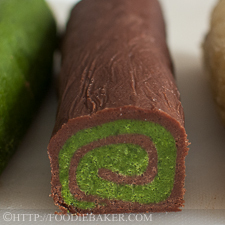 Add in the flour and cocoa/matcha powder (if making other flavoured doughs). Stir with a spatula until all the flour has been incorporated and a smooth and soft dough has formed. Turn the dough out on a large piece of clingfilm. Flatten the dough into a rectangle and wrap it with the clingfilm. Refrigerate and chill for at least 30 minutes until the dough is firm. Repeat to make other doughs. Once the dough has chilled, cut the doughs into half. 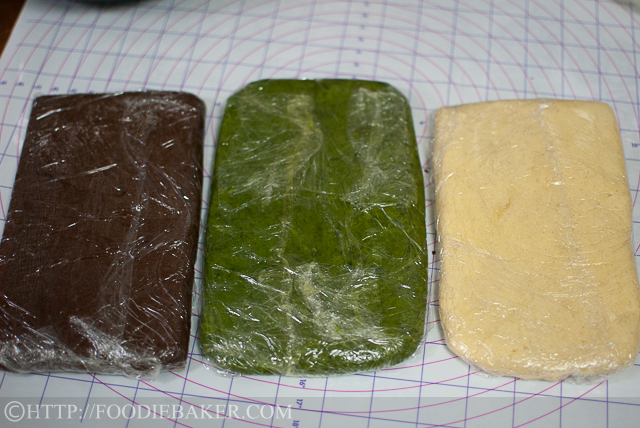 Roll each half of the dough out into a 5 x 10-inch rectangle. Brush with a thin layer of milk and lay your desired mix-and-match flavour on top. Roll it up tightly into a log. 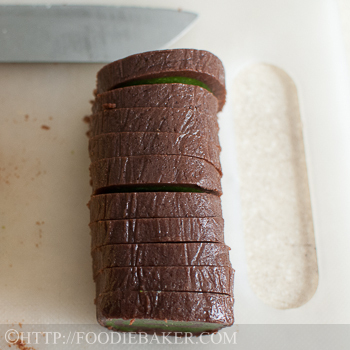 Wrap the log with clingfilm and refrigerate again for at least 30 minutes. Preheat the oven to 180 degrees Celsius. Line a baking sheet with parchment paper and set aside. Slice the log into ¼-inch slices and arrange them on the baking sheet, spacing them 1½-inch apart (they will expand during baking). Bake for 10 to 12 minutes until lightly golden in colour. Cool the cookies on the baking sheet for 5 minutes before transferring them to a wire rack to cool completely. Store the cookies in an air-tight container for up to 1 week. Alternatively, you can cream all the butter and sugar together. Beat in the eggs and then the flour. Divide the mixture into 3 and stir in the flavourings. If your dough has softened too much while rolling out, chill it for 10 to 15 minutes before working on it again. I have to keep chilling the dough because Singapore weather is just too warm! Cookie dough can be refrigerated for 3 days or kept frozen for at least a month. You can slice the frozen cookie dough and bake them straight. If they are too hard to be sliced, thaw the cookie dough overnight in the refrigerator to soften it slightly before slicing. Ohhh yeah I recently also converted to a .com blog anf and indeed I haven found myself super frustrated not knowing how to handle certain issues with it….. oh wells.. anyway beautiful looking cookie! Love the different combination of colours and flavours! Aren’t icebox cookies the best? Love the flavor combinations and swirls in these. I bet they disappear quickly. i also had problems with my blog – i had actually bought the .com since june, but had various issues with it, and only finally managed to ‘launch’ it in december, but even then, i’m still facing little hiccups here and there. So i totally understand your pain! I haven’t made ice box cookies in years. These are so pretty and I am sure delicious. Thanks for sharing with the Recipe Box. They are being featured this week. 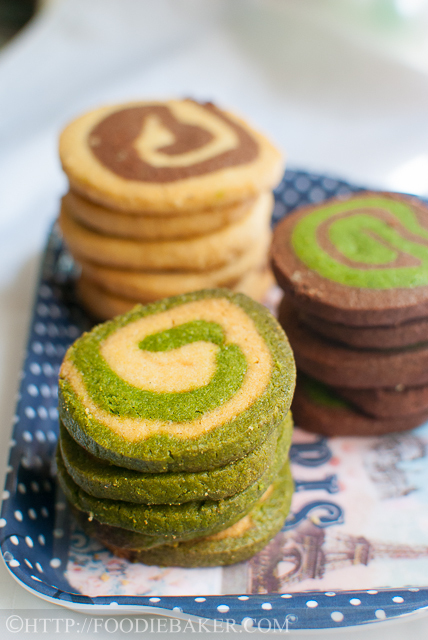 Beautiful cookies, I love the spiral and that green (Matcha) is so vibrant and looks incredible with the chocolate dough. Really well done. Wonderful spirals, as always with your posts. And no problem, I will keep visiting, here or wherever you post. Good for you Jasline! These cookies look amazing and regardless of how your (blog-techy stuff) is going, it’s great that you keep posting such yummy recipes. I’ll need to try this soon, I think my mum would love them too! 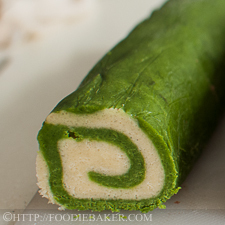 AMAZING green colour on the matcha dough. I could use several tablespoons and not reach it. 🙁 All 3 pinwheel variations look great. I’ve never made this type of cookie but woudl love to at some point. hi jasline, sorry to hear about your problem with .com. 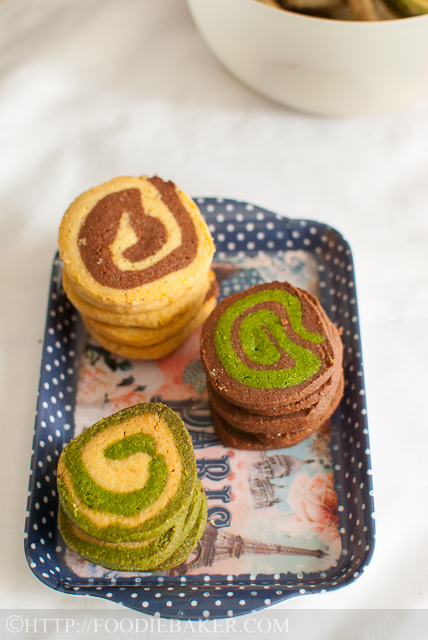 dont worry, i know where to go to look for you 🙂 you know, when i was looking at the photos of these spiral cookies, i immediately thought of snake cookies! i think the spiral pattern do resembles a snake…dont you think so? so apt for the coming snake year!